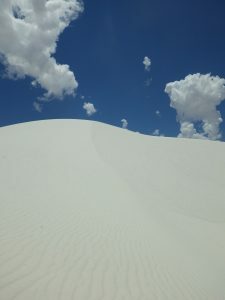 Last week, I decided to take a couple of days and visit White Sands National Monument. I’ve lived in New Mexico for almost three years and decided it was time. There is no excuse not to take advantage of a National Monument or Park when it’s in your backyard. From what I’d read and heard, WSNM is a spectacular location for exploring and stargazing. 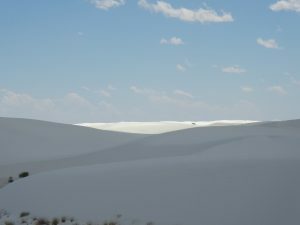 During the day, the dunes are beautiful – stark white, with very little relief as far as color or texture go. There is sparse vegetation, mostly consisting of salt-loving shrubs growing in the low areas between the dunes. 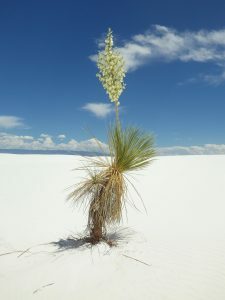 The occasional yucca manages to find a foothold, even on the dune tops. At night, there is very little light pollution, making for perfect stargazing conditions. I opted for a “backpacking” trip – hiking into one of the ten available back-country sites. My plan was to go in a bit after mid-day, set up my campsite, explore a bit and relax under my shade/tarp until evening. Permits are issued on a first come, first served basis. You must walk in to get one. There are also days when you can’t hike or camp: the missile test range is next door, and if they are testing, there’s no hiking or camping. Call ahead. I drove down to the visitor’s center, walked in at 11:00 am, and had my choice of campsites. 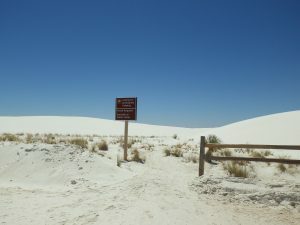 From there I drove to the trailhead parking lot, located the start of the dune-field trail, and began my hike in. So far, so good. The backcountry area is actually quite small. 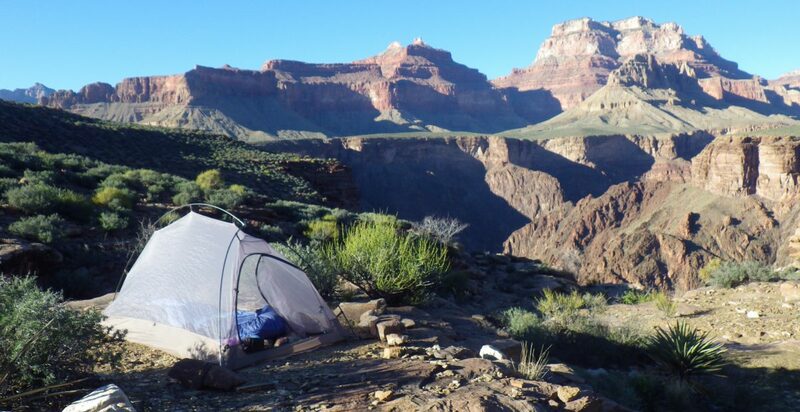 The trail is a 4-mile loop, with the 10 campsites branching off of it like spokes on a wheel. Each site is situated in the bottom of a low-lying flat area, behind a sand dune. There is no camping allowed on the dunes themselves. You’d think these low areas would be ideal locations for camping… One suggestion: if you are using a tent that requires staking out, bring tent stakes and a hammer. There are no rocks naturally occurring in the dune field and the gypsum hardpan is basically cement. Pushing in the tent stake will only result in a bruised palm and a very weak stake placement. I learned this lesson the hard way. After setting up my tent and tarp/shade, as securely as possible, I did some exploring. The Monument website recommends taking a fully charged cell phone, map, compass, and GPS. They also state that often-times GPS coverage is iffy, and your phone likely won’t work. Best to brush up on your map and compass skills. I can see how easily it would be to become lost in the dunes. The wind quickly erases your tracks, and the landscape is starkly white and barren. In bright light, the terrain appears to flatten out and you can become disoriented. 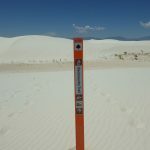 The backcountry camping area has Carsonite posts marking the trail, these are set on high areas, making it easier to keep track of your location. The other areas in the monument are not as well marked, so hikers be aware. After lunch, I took advantage of my shade, listened to a lecture on Greek Mythology and napped. It’s a great place to just hang out. I didn’t have any bugs, no crowds of people, and only one military drone. There are a lot of jet fly-overs, as the monument is located adjacent to an Air Force base, but I knew this going in. The jets were nothing compared to the wind that came on around 5:00 pm. I’d been checking the weather for a few days leading up to my trip, trying to average out the forecasts from NOAA, the Weather Channel, and AccuWeather. NONE of them predicted tent-flattening, tarp-flying, sand-blasting microbursts. If I’d had some sort of hammer-like device, I might’ve been okay, but without one I could not reset any of my tent stakes. I packed up my tent and tarp, and in the process discovered that my sleeping bag was full of gypsum. I packed that up too. After sitting in a ball for 30 minutes, waiting to see what happened, I came to the conclusion that setting up a stove and preparing dinner in this was not going to happen. Of course, that is when I decided that I was getting hungry. At around 5:30 I stood up and took a look around. A small wall of dust was building and heading my way, reminiscent of the 1930’s dust bowl photos my grandparents used to show me. Enough. I packed the rest of my stuff, put my shoes back on (you can run around barefoot as much as you want – no cactus) and hiked back to the car. As I was heading out, I passed several people hiking into their sites. They looked about as excited for the wind as I was. I now know how I’ll approach this when I go back. Yes, despite my failed attempt, I am going to try again. The place is just too amazing not to. First: go in early to get your campsite, then go do something else until late afternoon. Take a tent peg hammer. Don’t hike in too early – it’s hot in the sun; there is no water, so you must carry it in; the wind will pick up in the early evening, making it difficult to prepare dinner. You can minimize your exposure by going in later, after you’ve had dinner, for example. Or, go in the Fall, when the wind isn’t such a problem. 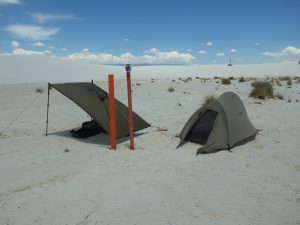 Backcountry permits cost $3, the landscape is surreal, and the light reflecting off the gypsum is brilliant! Take a good pair of sunglasses, some sunscreen, and a wide-brimmed hat. You can also buy a sled at the visitor’s center – the kids playing in the parking lot dunes seemed to enjoy them.